If you’re looking for something to do outdoors the first weekend of August, then go no further than the 17th annual Regatta at Lake Arthur, located on Moraine State Park’s South Shore on Pleasant Valley Road in Butler County. The environmentally conscious regatta (all of the entertainment is powered by solar and human-generated energy), will also continue to boast last year’s Building Healthy Places Initiative (initially inspired by a 2014 Urban Innovation Grant from the Urban Land Institute). “This initiative promotes living a healthy lifestyle and will feature wholesome food options and offer suggestions for people to get out and get active at Moraine,” said Muchnok. Three world championship events will take place during the regatta this year: the Puddle Duck Racer World Championship, the 2015 Pennsylvania Stand Up Paddleboard (SUP) Championship, and the Professional Disc Golf World Championships. “The entire Pittsburgh region is excited to be the host for the Professional Disc Golf Association World Championships (PDGA) from August 1 through August 8,” said tournament co-director J. Gary Dropcho. “Four courses throughout the region will welcome disc athletes from around the globe at Deer Lakes Park, Knob Hill Community Park, Moraine State Park and Slippery Rock University. 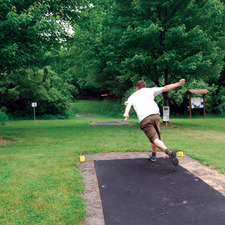 Moraine State Park is home to the Lakeview course, a par-66 course that is ranked in the Top 20 disc golf courses around the world, according to DGCourseReview.com. The course features a mix of elevated and flat tee shots, open grass fairway approaches and putting greens with deciduous and conifer defined corridors, a creek hazard and other out-of-bounds challenges. “While portions of the competition will be held at Lakeview on the North Shore of Moraine State Park, many activities, including putting, mini disc golf, and skillshot, will take place on the South Shore during Regatta weekend, specifically on Sunday, August 2,” said Dropcho. The tournament co-director is excited about introducing those unfamiliar with disc golf to the sport through this venue. “This promises to be a great opportunity for the public to be introduced to the sport, through lessons with the pro men and women players, and guests will have the opportunity to play a round or two as well. It’s just a great ‘lifetime’ sport that we want to share with everyone!” Dropcho said. The regatta will also welcome the Tribaloid Fly Mart, featuring specialized disc golf vendors showing their wares throughout Sunday’s event. For more information on the Regatta, visit www.lakearthurregatta.org. To learn more about the 2015 PDGA Pro Disc Golf World Championships, visit www.2015pdgaproworlds.org or visit the Pittsburgh Flying Disc Society website at www.psds.org.